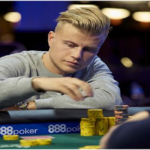 The event#67 of WSOP 2016, which was a $111,111 buy in No Limit Hold’em High Roller event, belongs to a 22 year old professional poker player from Saarbrucken, Germany Fedor Holz. Holz collected the first prize of amount $4,981,775 from the championship. The High stakes player is a professional poker player and had done great in many poker championships. He loves to play big games like this. Till date he has got 10 cashes from World Series of poker, and has been through 3 final tables but converted to only once. All time money for the player playing at WSOP is now surged to $5,675,543. The tournament is one of the largest and it received 183 entries from different part of the world. All entries generated $19,316,565 as cash prize pool and out of total entrants top 28 places were paid out. “It’s one of the best experiences of my life”, I started to get in to poker, when Antonio (Esfandiari) won the championship back in 2012, Holz said after winning this prestigious event. He also said that “I just so feel overwhelmed. I didn’t think it would be like this and I’m so happy that I did it for once. I always wanted to win big one for one drop tournament and here it is I just won it”, he added. The highly competitive tournament had some of the finest poker players at the final table and they were all looking to win this prestigious championship. Dan Smith, a Las Vegas poker pro received a total winning share of amount $3,078,974, being the runner up of the event and this was 25th cash for his at WSOP. Koray Aldemir from Vienna was at third position for $2,154,265. Jack Salter, from London, UK, collected $1,536,666, being fourth player. Brain Green, from Decatur finishes at fifth place for $1,117,923. Joe McKeehen collected $829,792, being sixth position holder. Nick Petrangelo, from Feeding Hills, finishes at eighth position for $486,383. Meanwhile a pro poker player from Las Vegas Scott Seiver was the first player who hit the rail at final table and booked for ninth position. He collected $384,425 from the tournament. This was 37th cash for the player and all time money for him is $3.7 Million now.